17 Apr 2019 / 21:54 H.
Ahmad Farhan Sharifuddin, 32, who is manager of the Financial Intelligence and Enforcement Department of Bank Negara Malaysia (BNM), said he received instructions from his superior Abd Rahman Abu Bakar for his team to conduct a raid at Ambank Jalan Raja Chulan on July 6, 2015. He also confirmed that the raid by BNM at Ambank Jalan Raja Chulan was to assist the investigation by a task force set up in 2015 in regard to Najib and 1MDB accounts and transactions in relation to purported breaches of Part IV of AMLATFPUA. 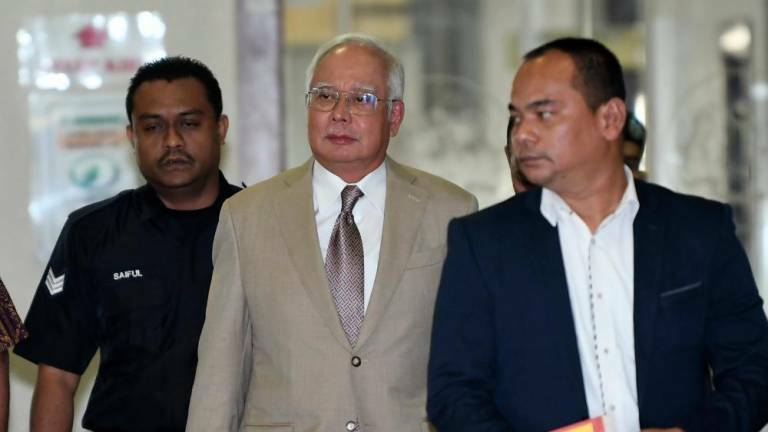 Cross-examined by lawyer Harvinderjit Singh, who was representing Najib, the prosecution’s fourth witness said he received the instructions the night before July 6, 2015 and was asked to come early to the office on July 6. Harvinderjit : What are the instructions you received from Abd Rahman? Ahmad Farhan : To investigate the bank account and transactions involving Datuk Seri Najib’s purported breaches of Part IV of AMLATFPUA. Harvinderjit : To investigate the accounts and transactions of 1MDB? Harvinderjit : You conducted a raid (involving) all together 12 accounts including Datuk Seri Najib’s saving account? The witness said three teams had conducted the raid on the same day but at different levels of the Ambank building. Asked by the lawyer whether he was aware of the agencies in the task force established in 2015, the witness said the police, BNM, Malaysian Anti-Corruption Commission but was not aware of all the members team in the task force except for former BNM governor Tan Sri Zeti Aziz. Explaining the raid, he said he and his team had gone straight to Level 24 of the Ambank building and met the bank’s relationship manager Joanna Yu and informed her that the team was conducting an investigation against Najib, SRC, 1MDB and other companies over purported breaches of Part IV of AMLATFPUA. He said he had met Joanna before, in May and June 2015, to record a statement pertaining to the same investigation. Harvinderjit : Did you seize any electronic devices such as computers, Blackberry handphone from Joanna Yu? Ahmad Farhan : I can’t recall. Harvinderjit : Do you know of a Blackberry phone conversation between Joanna Yu and Jho Taek Low or “Jho Low”? Harvinderjit : Did you know there was communication through e-mail between Joanna and the account holders such as Datuk Seri Najib regarding transactions?